Full front, back and screen protection is as easy as 1-2-3 with the Olixar XTrio in red. With a slimline shell for the back and front that clips together seamlessly and a tempered glass screen protector, your iPhone 8 is fully encased and safe. Perfect case for my iPhone red! 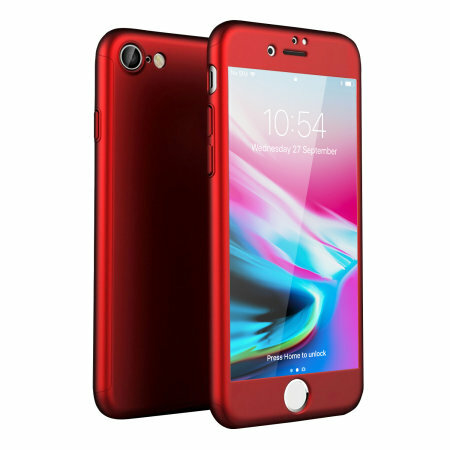 This is a great case for my IPhone 8 red. Protects the whole phone whilst not adding too much thickness and importantly it’s red! great quality fully covers phone for piece of mind. Love that the colour of the phone cover matches the phone. Protection and style. Looks good, the only issue is that it doesn’t quite meet at the joins, so you can still see a small bit of the phone. My sister had the same one though and hers is perfect. So a mixed review. It’s always hard to judge something online. This cover was better than expected. Front and back were a perfect fit for iPhone 8. Other reviews said the screen protector was hard to fit but if you clean the screen properly first, then fit the cover and then insert the screen protector it seems easy enough. There is a tiny gap around the screen cover but this will only attract a bit of dust rather than leave the screen open to risk of damage and by removing just the front of the cover this can soon be cleaned up too without disturbing anything. When my son saw it he ordered one immediately. Not a hard case. Not well made at all. I brought this case because I wanted the whole phone protected. This seemed perfect for me and for the price it is I thought it would have been the case to protect my I phone 8. Unfortunately it’s not hard at the back. Doesn’t over much protection and worst of all it doesn’t fit well. The Case still has gaps in it once clipped in and the glass protecter is a few mm to small which leaves room for the screen to get damage and dust. For the price I was expecting a flawless case well made but was wrong. Do not buy this. It looks great but don’t protect the phone well. I followed all the instructions step by step. Read all the instructions before fitting and lay all the pieces out on a table. Does exactly what I wanted it to do, protect my new iPhone. BUT, and as one reviewer stated, placing the screen protector in the right place was fiddly, as there is no guidance. This means that, and with old eyes (like mine), placing it in exactly the correct position, to avoid the small gap that I have along two sides, took several attempts. This has disadvantages because to check the positioning one has to keep putting the case on and taking it off again, I worried that I would damage the case doing it too much, and it tried my patience. I will need to be mindful about the gap being a dust/dirt trap. This case still gives the IPhone 8 it’s slim look but with little bit of added protection. It fits my existing car cradle which has saved me purchasing a replacement, however the only issue is with the screen protector that comes with it. It is approximately the same size as the phone screen but when its fitted it appears to leave a margin either side and appears not to have adhered to the screen, however it isn’t visible when the screen is active. I’ve tested it on a wireless charger and it does charge. Cosmetically it looks and feels nice and isn’t as slippery as the uncased phone. Great case. Fits really well, as does the tempered screen. Feels nice to touch, doesn't mark or scratch easily. Very clean and slim look. Buttons press easily. Camera lens well enough protected. Very happy! Metal type case with front cover completely encases phone . Perfect fit for iphone 8. Provides good protection. Colour of rose gold looks good on phone. Would definitely recommend. Great feel to this case. The screen protector however is a few mm to small and has a gap all around the middle of the case where this sits on top of the phone screen. I also made the error of not knowing which way round the protector went as no instructions. I wasn’t aware it had adhesive properties as it didn’t indicate this. Slightly annoying therefore that I now have a marked and blurry screen due to my error. The only other issue is that when you swipe up, either when locked or unlocked, it doesn’t always recognise this action as the case sits a tad too high, it’s a matter of 1mm or so if that. Overall I’d reccomend but could probably do with a design tweak and at least a sentence or two on the packaging to inform us older generation how to fit it correctly! I had been looking for a slim, hard wearing phone case for my new iPhone 8. Ideally one that conselled the entire phone to protect it. eBay has some from £4 however I wanted quality... I then located via a google search ‘Mobilefun’. I checked the reviews and clearly saw these guys know what they are on about. Truly awesome website, great delivery times and brilliant products!! Highly recommended and thanks again.